We have bird houses for: chickadee, wren, bluebirds, flycatcher, purple martin, cardinal and jay, wood duck, hummingbirds by: Droll Yankee, Perky-Pet, Havahart, Heath, Heritage Farms, and No/No Birdfeeders. We carry a full line of bird feeders and suet feeders. We have feeders for thistle seed for the gold finches and feeders for the other birds. You'll also find squirrel resistant and squirrel proof feeders. There are poles to hang them from, and baffles to put over them to protect from squirrels. We carry Perky Pet, Heath, Colibri, Droll Yankee and other brands. We also have locally hand crafted bird feeders. We're confident you'll find just what you're little birds need. 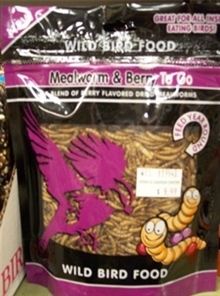 We carry a large selection of bird feed. You can find striped sunflower seed and black oil sunflower seed. There is also millet, thistle and mixes for bluebirds. We have woodpecker mix, safflower, cracked corn, peanuts, sunflower chips and gourmet mixes. Your birds deserve a beautiful bath, and we have them. You can mix and match the base to the top of many styles of concrete birdbaths. We also have nice hanging birdbaths and heaters for the winter time. We have a large selection of hummingbird feeders from little feeders that you can put in your planters to large decorative feeders. We carry Perky Pet, Droll Yankee, and Best 1 feeders. 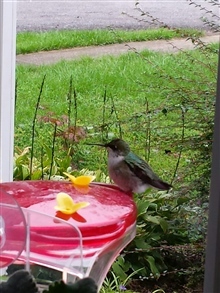 Don't forget to pick up the nectar for your feeder.